the London shop where Orwell worked in the 1930s. I’d like to think Orwell would be heartened by the resurgence of interest in the 19th-century novel, at least for Austen and Dickens. But I wonder if some of the same generalities apply today, that is, are there still marked differences between what people buy, what they borrow from the library, and what they actually read? 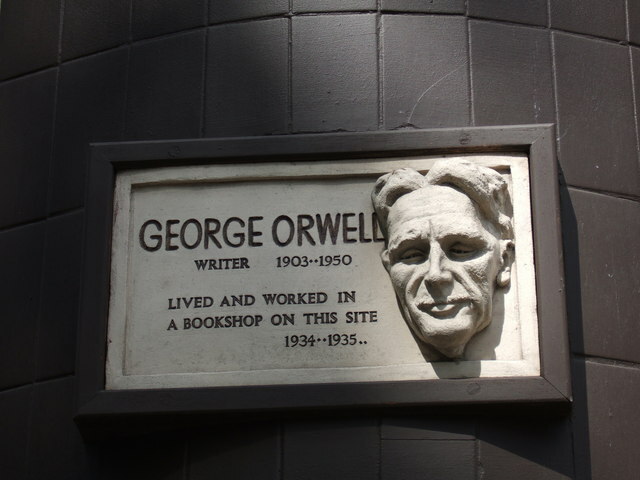 While Orwell concludes that the book trade was definitely not for him, in fact, it temporarily caused him to lose his “love of books”, I think I’ll hold on to my fantasy shop. It gives me all of the imaginary pleasure, with none of the hardship. * Respectively, Ethel M. Dell, a successful author of romance novels, considered quite racy for their time; Warwick Deeping, a prolific and popular novelist (and doctor) who’s most well-known work, Sorrell and Son, was called a “wish-fulfilling dream of perfect filial love” by Kingsley Amis (according to Amazon.com); and Jeffrey Farnol who wrote a number of romances and swashbucklers, including Waif of the River and The Geste of Duke Jocelyn! "are there still marked differences between what people buy, what they borrow from the library, and what they actually read?" Many people buy talked-about books to display their hip-ness, and many of these books must go un-read, especially once the Next Big Thing comes along. One example that comes to mind is Thomas Pynchon's Mason & Dixon. It was hugely hip. But how many book buyers actually read it, I wonder? One time someone was looking at our bookshelves (in NYC) and said about Infinite Jest, "Oh, you have a copy of that, too? There's a book everyone owns and no one has read." I was amazed. That's Allan's favourite book of all time. He's read it more than once, frequently re-reads portions of it, writes about it, discusses it online. I had no idea that some people use it as a prop! So I think the pattern (like your bookstore dreams) still exists. Re: the next big thing. I wonder if all the people who bought Walter Isaacson's tome about Steve Jobs will read it. It's funny, too, you made me think of the "furnishings" in certain hotels or even restaurants--what appears to be a shelf of books are actually a solid block of material made to look like the spines of books. It seems like an acknowledgement that reading books is good for you (and makes you look good), but ultimately too much trouble. When I was in junior high, I babysat at a home that had books with wrapping paper on the shelves, like the old book covers we used to make out of brown paper shopping bags, but shiny and brightly coloured. It turned out they were just random books, used only for show! I had never seen that before, came home and told my parents about it. After that, we called that babysitting gig The Fake Readers. Re Steve Jobs, good example. I hope people do not treat Robert Caro's tomes that way, he's too good. But big fat books may be singled out for that treatment. I cannot recall, but I assume we threw that impudent rascal out on the street immediately forthwith. Spoken like a true booklover!